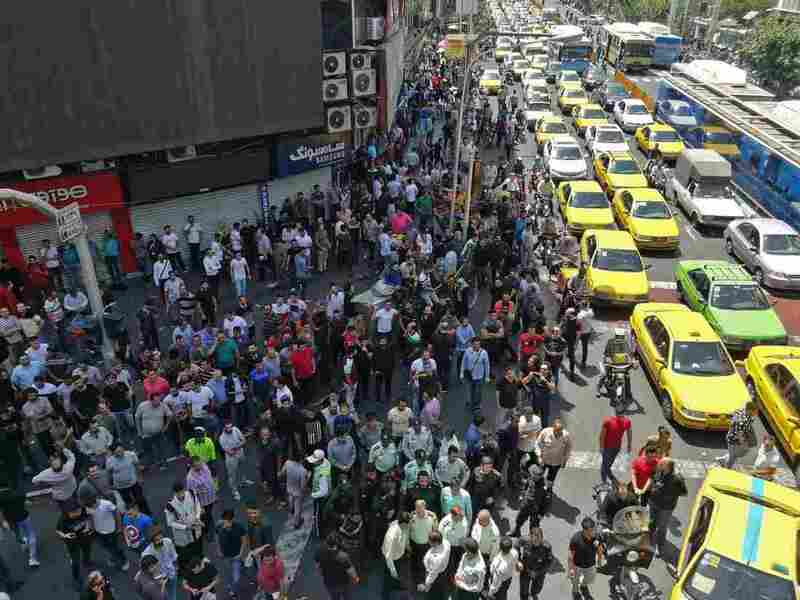 In Tehran, Economic Protests Flare As Iran's Currency Plunges Demonstrators took to the streets in the capital this week, shutting down the capital city's sprawling Grand Bazaar and protesting outside the parliament. Demonstrators filled the streets of Tehran on Monday to protest economic downtown in Iran. Protesters called for shop owners to close their businesses as the demonstrations ramped up on Monday. They marched to the gates of Iran's parliament, and police tried to quell them with what multiple news outlets said appeared to be tear gas. Videos purportedly showing clashes between security forces and protesters were put up online Tuesday. BBC Persian posted footage of people running as security forces approached. برخی گزارش‌ها از اعتراضات امروز لاله زار حاکی است که ماموران امنیتی دست به تخریب اموال زده‌اند. The rial has fallen to a new low — 90,000 against the U.S. dollar on the country's black market, Iranian media said, despite government efforts to control the currency rate. The official exchange rate is about 42,000 rials to the dollar. Anti-government demonstrations driven by economic troubles erupted across the country last December and January. But they didn't gain traction in Tehran. This week's demonstrations in the capital were the biggest in years, multiple media outlets have reported. Abbas Milani, director of Iranian studies at Stanford University, tells NPR via email that these demonstrations are different. "They have taken place amongst the regime's hitherto reliable basis of support — the members of the bazaar and the working classes. For over a hundred years, strikes in bazaars have been harbingers of change and invariably the clergy were allied with these merchants. Now the ruling clergy are the subject of the merchants' wrath." President Hassan Rouhani addressed the protests on state television Monday night, telling the Iranian people that the United States is to blame for the country's economic difficulties. He said the spontaneous demonstrations were caused by "foreign media propaganda." He was also quoted as saying that the government would be able to endure the rial's downward spiral and upcoming sanctions, which the Trump administration plans to impose after announcing a withdrawal from the Iran nuclear deal in May. "Even in the worst case, I promise that the basic needs of Iranians will be provided. We have enough sugar, wheat, and cooking oil. We have enough foreign currency to inject into the market," Rouhani said, per Reuters. Iran's economy was lagging before President Trump announced the exit from the Iran nuclear deal, and it has grown weaker in anticipation of U.S. sanctions, NPR's Peter Kenyon reports. The country's buying power and retail sector have suffered. The Central Bank of Iran reportedly announced that it will create a secondary currency market to relieve pressure on the country's currency. Citing economic security, Iran is also clamping down on foreign products by banning imports of more than 1,300 items, according to Reuters. It wasn't immediately clear who led the Tehran protests. Some observers believe that conservative factions in the government may have encouraged the demonstrations in an attempt to undermine the more moderate Rouhani. But some protests evolved into chants with anti-government slogans, according to the U.S.-government funded Voice of America. Milani said that Rouhani faces pressure not just from the angered public, but radical conservatives such as the leaders of the Islamic Revolutionary Guard Corps. "The hardliners clearly think they can ride public dissent into more consolidated power for themselves," he said. "But they might well have underestimated the seriousness of the crisis and its possible outcome."